PARIS — Intelsat’s Galaxy 15 telecommunications satellite, which remained electrically active while adrift in orbit for more than eight months, was rendered unable to take commands by an electrostatic discharge that fouled its onboard software, Intelsat officials said today (Jan. 13). The which occurred last April, forced Intelsat and operators of neighboring satellites to perform orbital maneuvers to avoid frequency interference as Galaxy 15 drifted along the geostationary arc. Intelsat officials say the glitch had nothing to do with solar activity. In a conference call with reporters, Tobias Nassif, Intelsat vice president for satellite operations and engineering, said a failure review board that includes representatives from Washington- and Luxembourg-based Intelsat, Galaxy 15-builder Orbital Sciences Corp. of Dulles, Va., and the Los Angeles-based Aerospace Corp., will likely report its final conclusions about what went wrong sometime in February. But because Intelsat and Orbital were able to recover and regain control of the satellite once it lost — months later than expected — its Earth lock and was reset, the possibility of a hardware failure has been eliminated. The exact cause of the electrostatic discharge may never be known. Similar phenomena affect other satellites in orbit from time to time, although Galaxy 15 is believed to be the first to have reacted the way it did. Intelsat and Orbital have designed three software “patches” that should prevent a recurrence of the problem on Galaxy 15 or any other Orbital-built satellite that uses the same platform. The software uploads are mainly designed to ensure that the satellite will respond to commands even if a similar electrostatic discharge occurs, and that its communications payload will automatically shut down if it has not received specific ground commands within a 21-day period. “We ruled out any activity from the sun as having any impact on Galaxy 15,” Nassif said. Industry speculation at the time of the failure was that unusually intense solar activity around April 5 could have triggered the satellite’s failure. Orbital is also reinforcing components on similar satellites that have yet to be launched. Intelsat expects Galaxy 15 to arrive at its test position of 93 degrees west around Jan. 15, where it will undergo a full battery of tests before being redeployed as an operational satellite with more than a decade of life remaining, Nassif said. With Galaxy 15’s C-band payload still active and threatening to interfere with other C-band satellites in its path, Intelsat was obliged to craft flyby procedures that permitted the satellite to wander through other satellite positions without wreaking havoc. Fifteen such maneuvers were conducted in total. During two of these flybys, Galaxy 15 came to within 0.4 degrees of a neighboring satellite — a feat Nassif said has never been attempted for telecommunications satellites. Despite this proximity, the Intelsat-designed signal rerouting was able to prevent any major disturbance of other satellites’ signals. Dianne J. VanBeber, Intelsat vice president for investor relations, said Intelsat has not yet calculated the cost of the Galaxy 15 problem in terms of labor hours and the unplanned use of teleports. But, she said the total is almost certain to be modest — perhaps less than $1 million — during the nearly nine months from the April 5 failure to the satellite’s late-December return to operational control. Intelsat replaced Galaxy 15 with an in-orbit spare satellite, Galaxy 12, for the company’s C-band customers, who are mainly North American television broadcasters. But Galaxy 15 also carries an L-band navigation payload managed by Lockheed Martin Corp. for the U.S. Federal Aviation Administration (FAA). 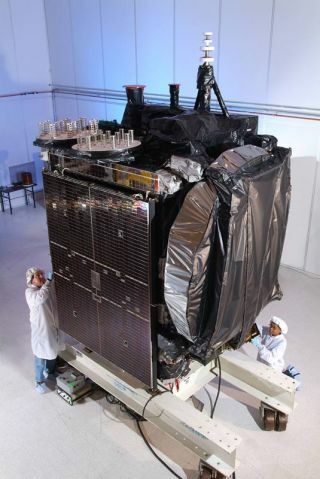 The payload is one of several aboard geostationary-orbiting satellites that act as an overlay for the U.S. GPS positioning and navigation constellation. Midway through its orbital drift, Galaxy 15 was no longer in a position to provide the navigation service, and the FAA was unable to provide the expected service for Alaskan air traffic. Nassif said Intelsat expects this navigation service to be resumed once the satellite completes its tests.